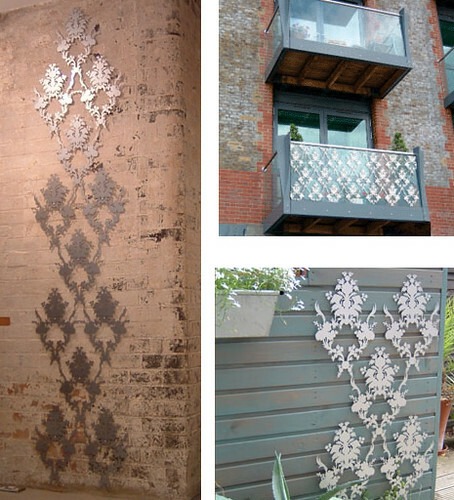 Susan Bradley creates this super innovative Outdoor Wallpaper that is so original that I had to post about it. She takes an original concept and steps it up a notch to something that's very cutting edge and innovative. Susan says, "It can be used as a unique garden trellis, screening or simply as a decorative feature or installation to create an immediate impact in any space. Its fixings locate it a distance from the wall, allowing plants to grow up it and adding depth and shadow to the piece." I really love these, especially the one shown in the silver against the brick wall. Stunning. 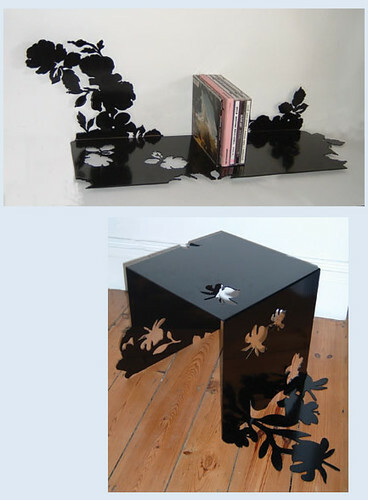 If you like her style, you may really love her Creep collection of shelves and tables. Nothing creepy about these, in fact, they are quite playful, functional, different... available in many colors (shown below in black). You can also purchase a few of her items online here.